This is a new to me silhouette. Sticking to fluid styles and untucked tops due to the battle of the belly bulge. What do you think of culottes on me? I bought one pair in black and one in white but I have no idea if these are the right length or not. 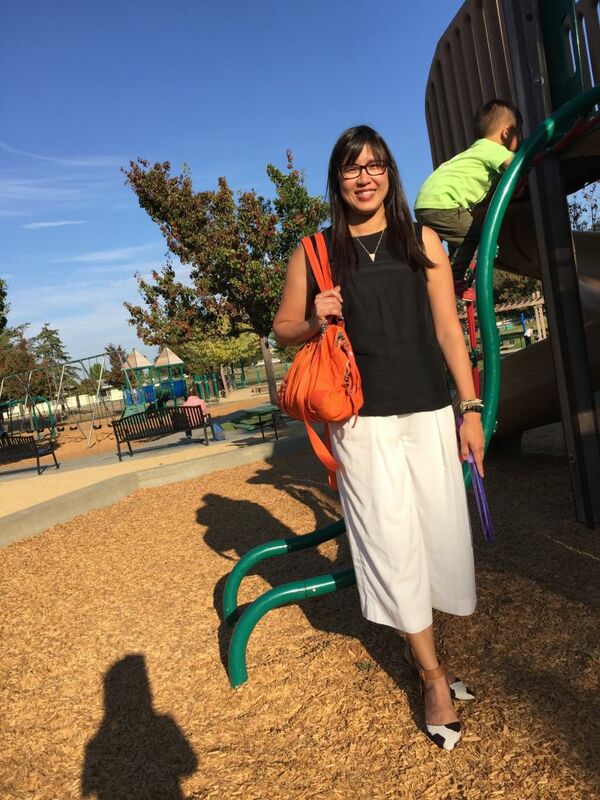 The silk tank+culotte combo kept me cool during the heat wave though. Disclaimers--these outfit photos were all taken at the end of the day, so please excuse the wrinkles. And also please excuse the funny poses because culottes are hard to photograph--when I stand with my legs together it just looks like a skirt! And Okalas were the totally wrong choice of shoe for MOTG at the park, but I met the kids there right after work. At least the next time I was a bit more prepared and wore flats to work. Field photos taken by 5 year old DS1. The black and white necklaces were $7 each at Banana Republic Factory store and I've been wearing them a bunch! Still like doing the matchy matchy thing with the accessories. I stuck with shoes with ankle straps to fill in the gap so I didn't look like I was wearing highwaters. 1-4. Lafayette 148 black silk tank.